Changing trends in customer engagement have led to innovative ways of using chatbots resulting in increased sales and positive brand impact for customers. Engaging with your customer has been one of the primary focus areas. All organizations exist to serve customers. A happy customer can be a brand ambassador for you and will spread the good word. In recent years the technology used for customer support, customer engagement and digital marketing has changed at a rapid pace. They have come a long way from the good old telephonic support to instant messaging chatbots now ready to serve you on a 24×7 basis. Digital marketing and customer support is an area that has been dynamically impacted by changing technology. Customer engagement has gone beyond the static nature of websites and emails to the web and mobile-centric live real-time engagement with chatbots. Competitive forces are making it mandatory for firms to adapt to digital means to sustain and stay ahead of the competition. Has your organization adapted to the new technologies? Check out these facts and decide. Customer support and digital marketing have been using tools like – emails and social media to engage with customers. However, there have been multiple changes on those channels which have become crowded. Mobile apps have distracted the users away from websites due to their portable nature and instant availability of information- anytime and anywhere. Customers and platforms have options to change their preferences for receiving or sending information. That impacts how you can engage with your customer target audiences. Email has been a potential and successful area. Between 2014 and 2018 the average office worker received about 90 emails a day and sent around 40 business emails daily. Hence, it has become difficult to get to your customer in such a crowded space. Social media platforms like Facebook have made recent changes to its algorithm which prioritizes what friends and family share over content from advertising brands. Data privacy acts are also limiting the options of using social media while targeting customer segments. It is due to all these factors that chatbots using artificial intelligence capabilities are being used to engage with customers. You can see more examples here that show how organizations have adapted the chatbot technologies successfully. Engaging with customers through chatbots is turning out to be the most successful tactic. As per Octane AI that publishes Chatbots magazine, 15 to 60 percent of people who receive a message from a Messenger chatbot with a link to an external URL click the link. Thus the level of engagement with a chatbot is higher and more interactive. It leads to better results if you are providing support to a customer or performing marketing campaigns. Chatbots provide a higher level of engagement while respecting user privacy. Facebook, for example, has rules that ask for the user to engage with the bot first before it can send messages. Chatbots provide multiple advantages like instant support, 24×7 availability, improved efficiency, real-time engagement, and cost savings among other benefits. This has made it a popular choice among organizations to use chatbots for customer support. Travel has been a popular domain that has gained a lot of traction ever since the internet has started. Hipmunk is a popular platform that let you search for travel deals. Many users have used it to book travel-related activities like flight bookings, rental cars, hotels, and tour packages. Hipmunk had been serving its customers well. 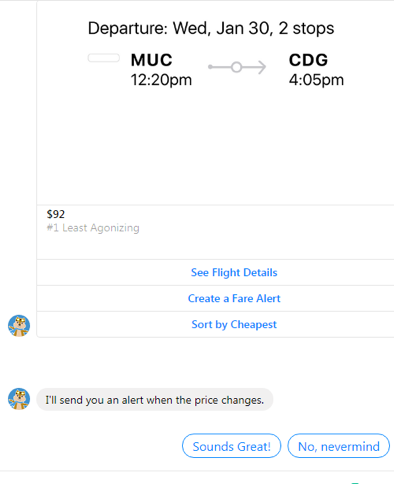 However, in an attempt to use the advantages of digital technologies to engage with the customers at a closer level, Hipmunk created its “Hello Chatbot”. Hello, chatbot helps people to search and reserve their travel activity of choice with ease. The chatbot can be integrated with various chat applications like Facebook, Skype, Slack or some other popular chat applications. The chatbot is AI-based and determines the user’s location. It then aggregates and promotes discounts and deals on travel packages. The customer benefits from avoiding seeking and analyzing deals on multiple websites to arrive at one of a choice. The chatbot searches hundreds of travel options and returns with the optimal deal in just a couple of seconds. The chatbot uses very friendly language and tries to imitate a travel agent. Hipmunk has been able to convert users to book flights and deals with its high level of engagement. It can share location maps. The customer’s travel search process becomes brief and conversational fetching great deals, all from a chat window. It can answer vague questions and delivers a valuable experience to customers. You can set up fare alerts right from the chat which makes it very convenient. ‘Whole foods’ is a health food chain that operates online as well as in brick and mortar stores. They have an interesting engagement with their customers while they deal with grocery delivery, meals, and catering. They provide users with food products, recipes and inspiration to cook up a variety of dishes. 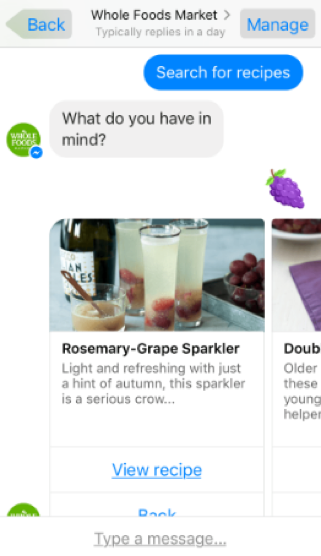 ‘Whole Foods’ has a chatbot that communicates with customers via Facebook Messenger. The chatbot presents multiple options to the user for local and international cuisine based on their preferences. Users can select filters on various types of cuisines and the chatbot will provide options for the kind of recipe needed by the user. 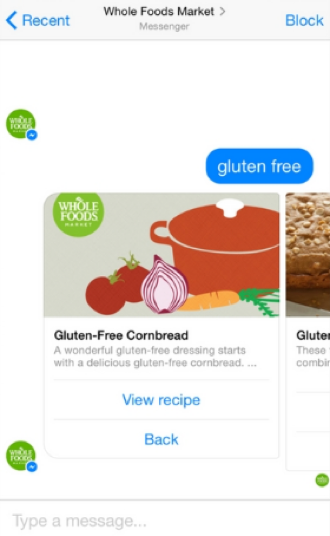 The Whole Foods chatbot on the Facebook messenger acts as customer support to users by assisting them with food and recipe options. It also redirects them to the ‘Whole Foods’ website driving traffic. The chatbot being present on the Facebook platform is a great advantage and ut’s users spend around 50 minutes engaging with the bot every day. 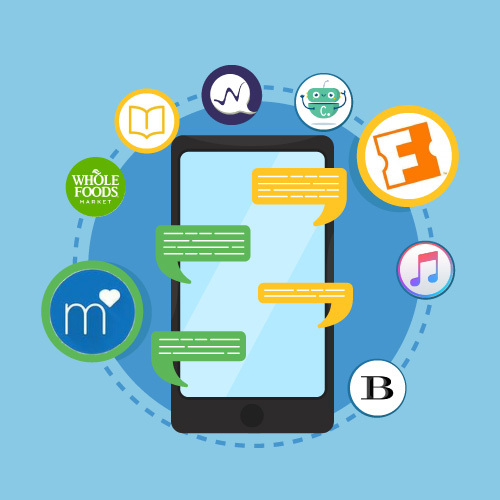 The chatbot also takes interactivity to another level in the sense that if a user sends a food emoji like – a cake or pizza emoji, the Whole Foods chatbot will present cake or pizza recipes to the user. You can have a good time chatting about food recipes and discover great options. You can ask the chatbot about gluten-free food or just post an emoji and it may get your recipe options. If you like the recipe, just go ahead and order the necessary ingredients through the chatbot. So the full sales lifecycle is driven by the chatbot. The BabyCentre UK website is a part of the global Johnson & Johnson family of companies which is a highly trusted source for pregnancy and childcare in the United Kingdom. In order to support its customers with queries related to children, they launched a chatbot on the Facebook messenger. The chatbot specializes in providing advice by asking the age of the child and any particular issues faced by parents. It then presents customized answers. 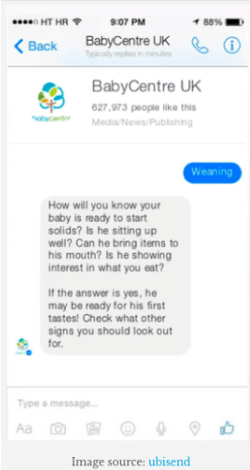 For example, it can advise parents when the baby is ready to have solid foods and signs they should be looking out for in the baby’s behavior. 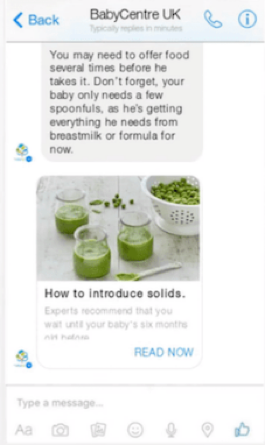 The BabyCentre chatbot yielded positive results and surpassed expectations. It saw an average read rate of 84% and click rate from chatbot to website of 53%. Chatbots avoid spam filters unlike emails and provide a more personalized experience for the customer. Sephora has been one of the leading make up brands to offer an elevated retail experience with a chatbot for its customers. It engages the user with a quiz that helps the bot to understand the customer’s requirements. It provides makeup tips and reviews on products. It advises users on what will be most suitable for them based on their skin types and other personality factors. Sephora offers 2 bots on Facebook. One is a Sephora Reservation assistant and the second one is a Sephora Virtual Artist for matching shades. The Sephora reservation assistant was able to get 11% higher conversion rates through chatbot bookings for makeover appointments at the Sephora physical stores. 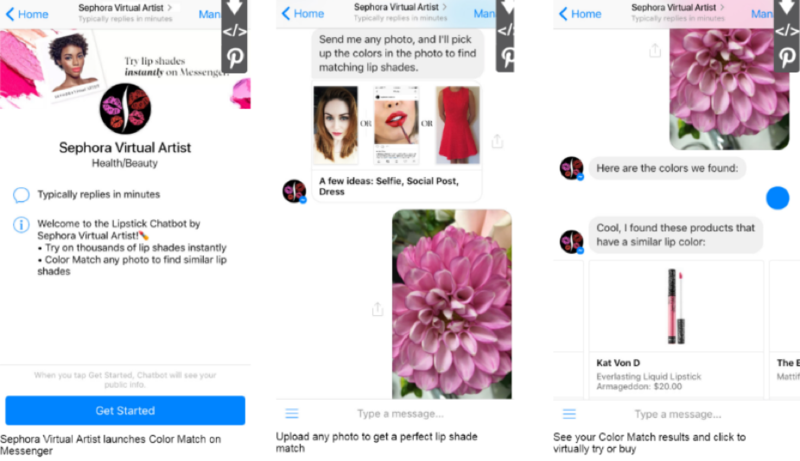 The Sephora Shade Assistant bot can advise a customer based on image choices sent. For example, a customer may scan the face of a celebrity and the bot can offer a list of matching lipsticks etc. 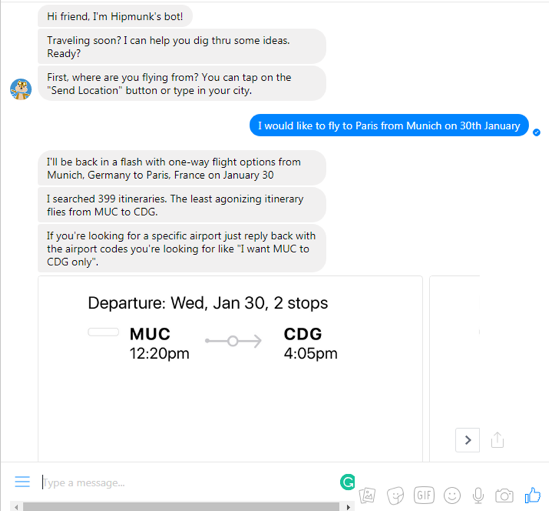 Lucie is Air France’s customer support chatbot which is offered on the Facebook platform. People can plan their trips while chatting with their friends. The chatbot helps in providing a differential personalized experience. It can sense the mood of the customer based on an emoji sent or by engaging in the tone of the conversation. Customers can describe their idea of the holiday and preferences they are seeking. Lucie the chatbot then suggests travel destinations, articles, videos; places of interest helping the user to plan the best trip possible. Ultimately, this results in a better wholesome experience which involves the destination, popular site to see and exciting events happening in and around rather than just booking a flight. You can chat with Lucie on Facebook or easily share it with friends and discuss the journey and possible destinations. Nike shoes wanted to capitalize on the idea of a personalized experience for buying sports shoes for their customers. The chatbot is available on the Facebook platform. The bot specializes in finding the right type of shoe for customers based on their personality. This results in the customer having a richer personalized and stylized experience while buying its range of Air Max shoes. 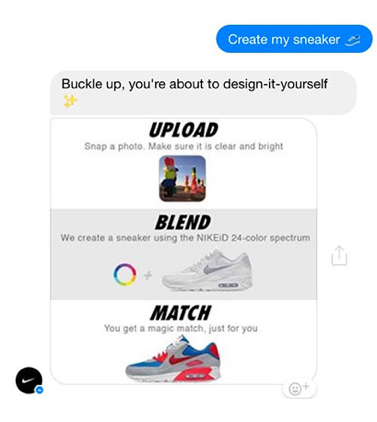 The chatbot also allows users to create their own Air Max shoe designs inspired by photos they send to the bot. Nike has also launched a bolder version called ‘Stylebot’. It is targeting female customers. Styling for the shoes include the likes of – shoes for the working girl, sporty girl and multiple options for different customer segments. The bot displays information on the shoe and if the user is interested, it links to further details on the relevant Nike website section. The Bot provides style options by using emoji’s with a youthful feel and chatty conversation that makes browsing the shoes much more exciting. NikEid 24 color spectrum provides the closest range of shoes in the color scheme of your choice if you upload a colorful photo. 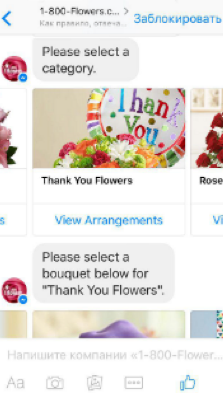 1-800 Flowers was one of the very first florists to offer a chatbot on the Facebook platform. It allows members of the platform to buy flowers and have them delivered to the person(s) of their choice. The chatbot offers an array of flower arrangements and bouquets. 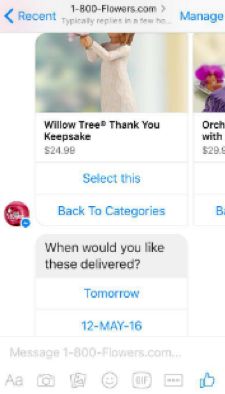 Once the customer has made a choice, the chatbot will ask further details as to what they would like the note to say, address to be delivered etc. The chatbot offers a very convenient way to complete the transaction all through the chatbot saving time and making it easy for the customer as well. 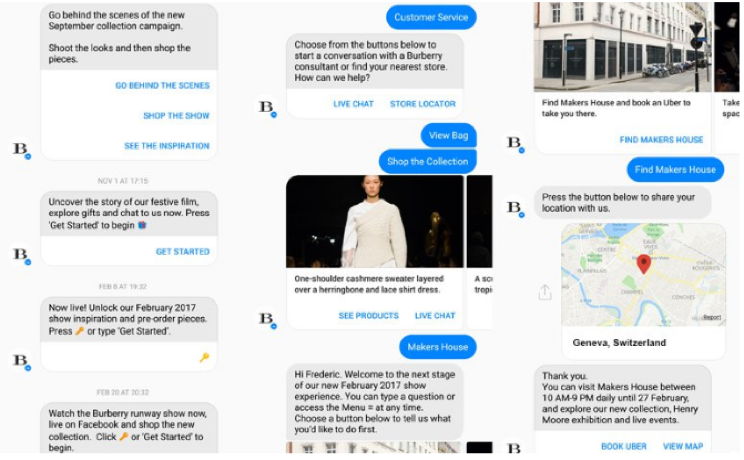 Luxury brands like Burberry are using the chatbots for a ‘behind the scenes’ view of their fashion shows and collections. It promotes its products on Facebook to help users discover its fine luxury products in detail by offering a close virtual look. It also guides the users towards various purchase options like the nearest store based on their location. 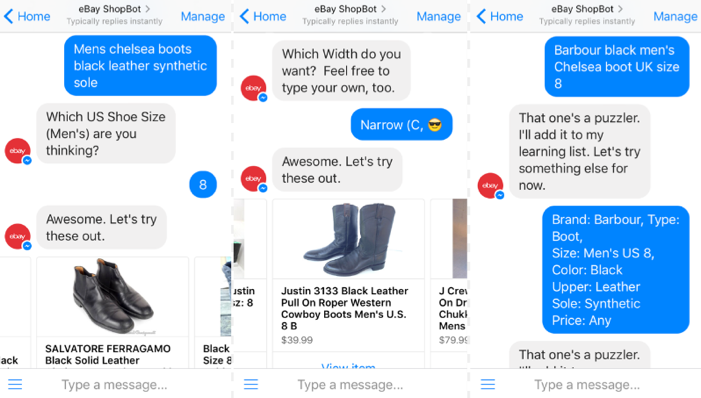 The mega-auction site, eBay has an artificial intelligence-based virtual assistant called ShopBot. It helps eBay platform customers find the best deals. Customers also receive personalized results based on their interaction with the chatbot. The chatbot is also enabled to deal with image searches. 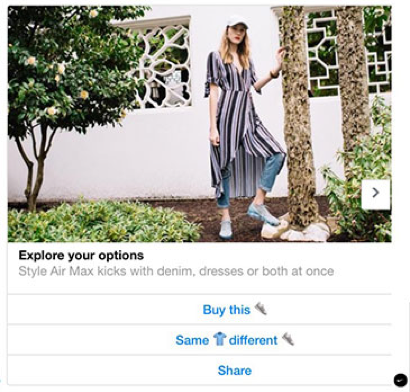 For example, a customer can ask to find types of shoes and the chatbot will provide the details of relevant items that are available. 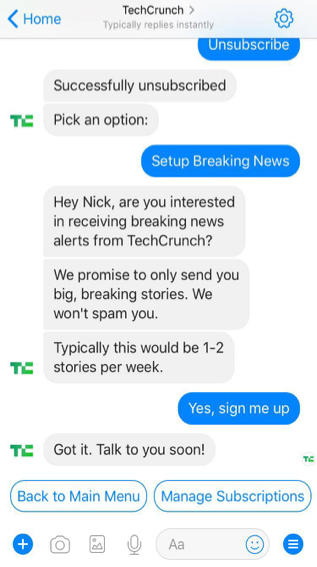 TechCrunch is a leading technology magazine and it uses Chatbots to send users more personalized content. You can interact with the chatbot and select the type of stories you prefer, hot or trending topics, or from specific authors etc. 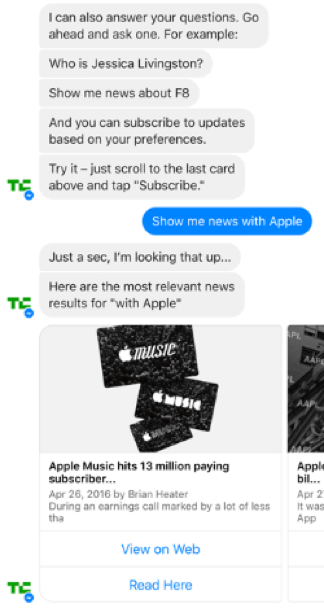 The interesting part of the TechCrunch chatbot is that it keeps track of what content you are reading and serves up similar ones. There is too much content online and the TechCrunch bot helps you to narrow it down to your tastes and preferences. You can make a choice on topics of your interest and the frequency to receive the articles. All this leads to a positive brand association and enables TechCrunch to drive more focused and engaged web traffic to their website. You can see so many interesting ways in which chatbots are supporting customers and driving business. 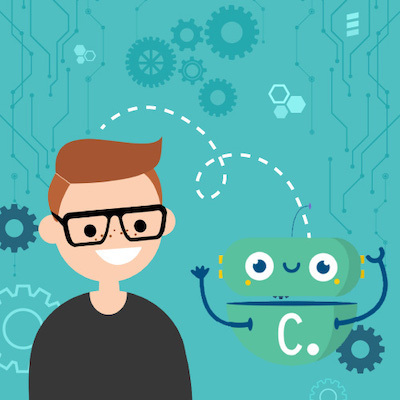 Learn more about customer support bots on our blog, but why not try it for yourself? Get in touch with our team to discuss your project. Book a demo below.